First of all welcome to what I hope will become a regular feature here at Press X or Die. This weeks free game is the R* classic and the launch of one of the most successful video game franchises, the original and iconic Grand Theft Auto. GTA was released for Playstation and Windows in 1998. 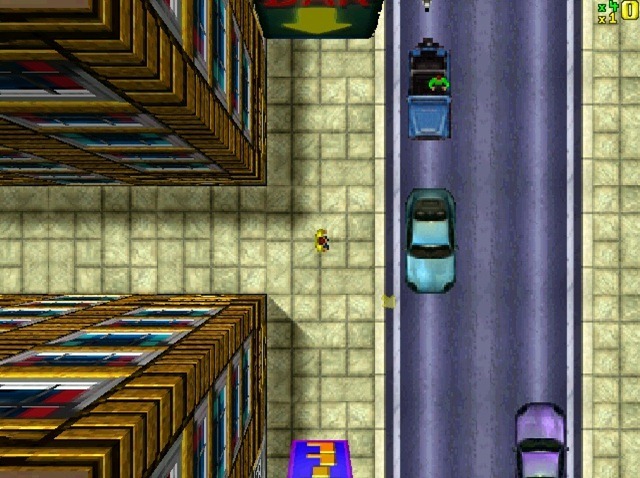 Unlike the current open world 3D running and gunning format of the series, the original Grand Theft Auto is a top down 2.5D affair. You play as a gang member for hire, working for mob bosses in the three now iconic cities of Liberty City, Vice City and San Andreas. You work through simple missions to make money and work yourself up through the ranks and unlocking the cities. As with the open world nature of the GTA series you can also make money through hit and run or taking on police officers too. After grabbing the game from Rockstars site (link below) and following the fairly comprehensive installation instructions you will now be a proud owner of GTA. I will suggest that if you are on Windows Vista or above you run the game in compatibility mode for either Windows XP or 2000. Also as I found out the game will not work if you have dual monitors. So before playing you will need to disable the second monitor or the game will crash. The game in looks is obviously not very stunning, but you’re getting a free slice of video game history, so no complaining. The movement controls are pretty bad, and you will have a few incidents with crashing your car as the top down view can be pretty disorientating. No GPS in this game, just an arrow to point you in the general direction, not even a map. So expect to spend a fair bit of the game lost in dead ends as you get to your next mission. Missions are simple affairs, gunning down rival gang members, car chases, and namesake grand theft auto. There’s a nice range of vehicles to nick, I prefer having a joyride in the less unwieldy vehicles like limousines. The handling is the series classic unrealistic oil slick drifting style which will result in many fun incidents and flat pedestrians. The original Grand Theft Auto may not hold much of a flame to the game changing Grand Theft Auto III, but it is the root of the classic and influential series. It’s great to play through this game and remember that it caused so much controversy at it’s release and compare it to what games it spawned and laugh.